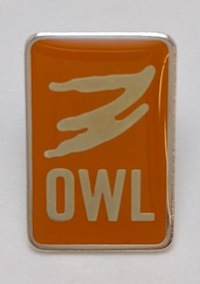 Our Whole Lives (OWL) Recognition Lapel Pin in orange, for young adults and adults. Our Whole Lives (OWL) Recognition Lapel Pin in orange, for young adults and adults. This pin is suitable for presenting to those who have completed the Our Whole Lives Young Adult or Adult programs. It features a convenient butterfly clasp.